Retro is back with the 2018 Dodge Challenger! This muscle-car outshines its competitors in the muscle-car segment by pushing them aside with a larger size and the attitude of a car that knows it's superior. The larger size of the Challenger means more legroom and trunk space, and even with the additional room, none of that takes away from the aggressiveness of this muscle-car, and the torque it can create. Speaking of torque, new to the 2018 model year is the Challenger SRT Demon. This new model is right at home at the drag-strip and packs a punch with 707 horsepower. Other additions to 2018 include making a rearview camera standard, along with Android Auto and Apple CarPlay. Even the SRT Widebody is getting a few cosmetic upgrades. With both a retro style and modern amenities, the 2018 Dodge Challenger will get your engine revving. 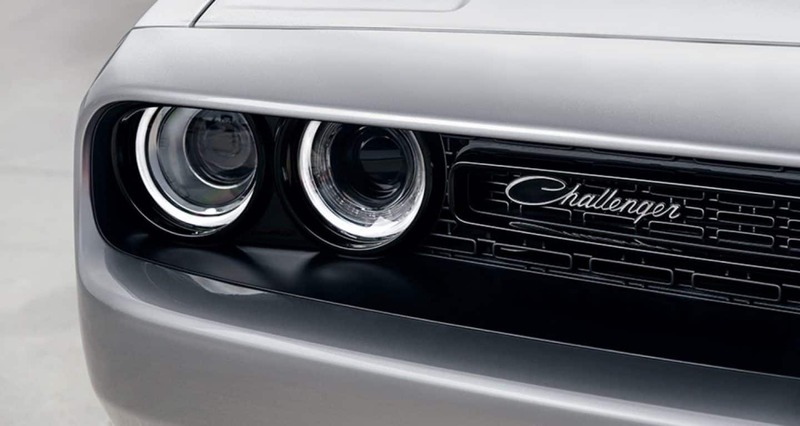 What are the powertrain options for the Challenger? 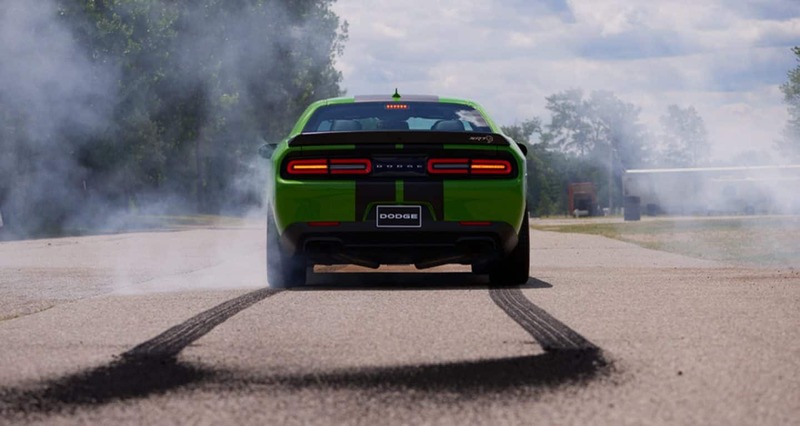 There are five powertrains available with the Dodge Challenger: 3.6-liter V6, 5.7-liter HEMI V8, 6.4-liter HEMI V8, 6.2-liter supercharged HEMI V8 for the Hellcat, and the 6.2-liter supercharged HEMI V8 for the Demon. The V6 powertrain comes standard with an eight-speed automatic transmission and the option between rear-wheel drive or all-wheel drive. This powertrain can create 305 hp and 268 lb-ft of torque. The first of the V8 powertrains, the 5.7-liter, can produce up to 375 horsepower and 410 pound-feet of torque, depending on whether you pair it with a six-speed manual transmission or the eight-speed automatic transmission. The three remaining powertrains punch up the level of power even further, with the 6.4-liter powertrain giving you 475 lb-ft of torque, the Hellcat's 6.2-liter powertrain giving you 650 lb-ft of torque, and the Demon getting as high as 770 lb-ft of torque with 100 octane. What are the model options for the Challenger? There are seven major model options available with the 2018 Dodge Challenger. 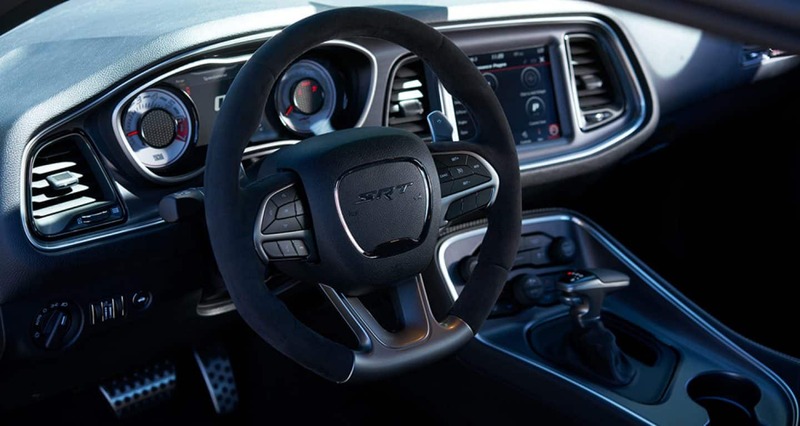 The base model is the SXT, giving you technology features like a 7-inch touchscreen, a six-speaker sound system, Bluetooth, Android Auto and Apple CarPlay smartphone integration, a rearview camera, and two USB ports. Other interior features include dual-zone automatic climate control, 60/40-split folding rear seats, 18-inch wheels, heated mirrors, a six-way power-adjustable driver seat, an auto-dimming rearview mirror, automatic headlights, and keyless ignition and entry. For a higher model option, you might consider the R/T 392, which gives you technology like an 8.4-inch touchscreen, and Alpine audio system with satellite and HD radio, and rear parking sensors. Other features include cloth sport seats, a rear spoiler, a sport-tuned suspension, and Brembo performance brakes. The SRT Hellcat is all about power and performance, giving you quad exhaust tips, unique exterior styling to make it stand out, automatic wipers, a sportier suspension, and automatic high beams. You can add a sunroof to every Challenger model, and if you buy an SRT, then you get a one-day course at the SRT Driving Experience school to learn how to drive your powerful Challenger. What makes the Dodge Challenger a safe vehicle? The Dodge Challenger is made with crumple zones in the front and rear to help absorb impact energy and redirect any of the danger away from passengers. 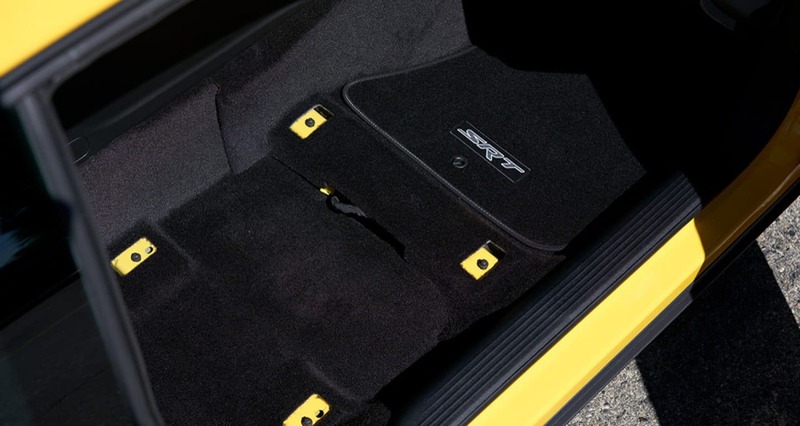 This muscle-car is also made with an incredibly solid high-strength frame, and includes airbags throughout the vehicle, along with active head restraints. A few of the safety systems you can find with higher model options include blind-spot monitoring, adaptive cruise control, ParkView rear backup camera, and forward collision warning. The Dodge Challenger is an aggressive muscle-car with retro stylings and added space to make carrying cargo that much easier. Check out this powerful car today, and schedule a test drive with us!